Like the long-gone steam locomotive, Norfolk Southern Corp. finds itself with a cloud overhead and a long shadow on the track. The rail industry’s biggest freight commodity, coal, has slid quarter over quarter for more than a year. Consequently, the Norfolk-based company has faltered against its largest competitors. And a Canadian railroad’s fierce merger pursuit still has Norfolk Southern’s board and leadership playing defense. Industry watchers wonder if Norfolk Southern can get enough traction to keep shareholders calm and quell takeover talk. For now, the company’s answer is “we’re working on it.” Some in the rail industry, though, suggest that Norfolk Southern has been slow to respond to the shifting market in comparison to other big North American railroads. Rick Paterson, a transportation sector analyst for Topeka Capital Markets in New York, points to the fact that Norfolk Southern was the last of the big six railroads to tighten its operations last year as freight volumes fell off. Paterson says the Virginia-based Fortune 500 company stepped up its streamlining only after the hard-charging advances by Canadian Pacific Railway Ltd. The Calgary-based company made three unsolicited and unsuccessful merger proposals to the Virginia railroad in the last quarter of 2015. “They probably wouldn’t have done [the cost cutting] otherwise,” Paterson says. In a late February transportation industry report, he notes that, when it comes to shrinking freight volumes, the staffing levels of train and engine crews “should move with minimal lag if management is anticipating or reacting quickly to changes in demand. All of the U.S. rails appear to follow the same trend except for Norfolk Southern,” which was slow to reduce personnel. The specter of an acquisition, though, got Norfolk Southern moving. In November, Canadian Pacific’s CEO E. Hunter Harrison Jr. — championed by its largest stakeholder, billionaire investor Bill Ackman and his Pershing Square Capital Management group — made the first of its offers to merge with the Virginia company. Norfolk Southern CEO Jim Squires beat back all of the offers, calling the proposals “grossly inadequate” and full of regulatory risk. The top offer for the U.S. railroad was about $30 billion. More than three months later, Canadian Pacific was still in pursuit, Harrison insisted that a transcontinental rail network stretching from Canada to the Eastern Seaboard would create greater efficiencies and reduce shipping costs for both companies’ customers because, among other benefits, it would smooth connections through a typical choke point, Chicago. On March 2, weeks after abandoning a possible proxy fight, Canadian Pacific filed a petition asking railroad regulators at the U.S. Surface Transportation Board (STB) for a declaratory order to approve a voting trust structure that would clear the way for a merger. The voting trust, the company explained in a public statement, has been used in dozens of mergers; it allows either railroad to be placed in a trust after clearing a regulatory approval of the merger. Canadian Pacific asked the STB to issue a ruling by May 6 so that the trust structure would not be an issue when Norfolk Southern shareholders gather at the company’s annual meeting, which typically is held in May. A spokeswoman for Norfolk Southern, Susan Terpay, says the company has yet to schedule its spring shareholders meeting and, in the meantime, will not elaborate beyond its recent public statements addressing the merger proposals. The company’s focus now, she says, is carrying out the five-year strategic plan unveiled by the company in December. Since then, Norfolk Southern has begun to consolidate regional operations, close some coal docks in Ohio, idle mainline tracks in West Virginia affected by diminishing coal traffic and cut overtime by 50 percent from last year’s level. It will also eliminate 2,000 jobs in the next four years, as part of a goal to reduce total spending by $650 million by 2020. Terpay notes that the company also is pursuing future growth in “service-sensitive” sectors such as intermodal (used to move consumer goods) and automotive shipments. Among industry experts interviewed for this story, the consensus is that Canadian Pacific’s merger effort is a long shot for several key reasons. One is the overwhelming opposition voiced in letters to the STB, a congressionally appointed board with three members. By early March, before Canadian filed its petition, the STB had received more than 220 letters addressing the proposed merger. Anecdotally, many letters supporting the merger came out of Canada, while significant disapproval came from state and congressional lawmakers in Virginia and other states including Illinois, Ohio, Indiana, South Carolina, New Jersey, West Virginia and Pennsylvania. Virginia Gov. Terry McAuliffe joined other state politicians and officials in supporting Norfolk Southern’s stand against the merger proposals. Private-sector opponents weighed in with their concerns as well. They include automotive companies like Subaru of America; CONSOL Energy, a Pennsylvania coal shipper; and both United Parcel Service and FedEx. Martin Cej, a spokesman for Canadian Pacific, says that the railroad received more than 80 letters supporting its proposal, including more than 60 that were forwarded to the STB. The weeks and months ahead remain uncertain as the regulatory board takes up the issue of approving or denying a decision on Canadian Pacific’s voting trust question. Industry insiders say that the process itself would take one year to 16 months, given the level of attention being paid to the two companies. This is also the first time that a railroad merger has come before the STB since heavy consolidation in the industry before 2001, when federal regulations raised a higher regulatory bar for future mergers. Wilner, a veteran of the railroad industry and regulatory world, compliments Norfolk Southern as one of the best-managed railroads in the long term and notes that there is no certainty that it would be recognizable after a merger, given the track record of Harrison and influence of activist investor Ackman. Should the merger navigate all of the regulatory and business channels, there is also the question of whether a combined railroad would move its headquarters to Canada, taking away a major regional presence, Stephens notes. 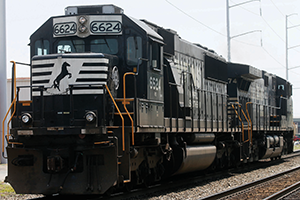 Read more Virginia Business coverage of Norfolk Southern Corp.